The Heidolph Laborota 4001 Efficient Rotary Evaporator offers you sturdy consistent performance in a compact contained package. This rotavapor is modular, with quick change glass components depending on your needs, this rotavapor in particular comes with a C-glass assembly which is ideal for trapping low boiling point solvents. The rotation speed range is programable between 0-270 RPM. This rotary evaporator is quiet to operate with a sparkless, brushless motor, and an automated lift. The Heidolph Laborota 4001 Rotavapor can handle volumes up to 3 Liters without a problem and lowers with an auto stop into the integrated heating bath. This rotary evaporator heating bath has a nonstick coated interior with encapsulated heating elements to prevent scalding. The maximum temperature for the heating bath is 180°C for oil and 100°C for water. This Rotavapor also features integrated vacuum control and a vacuum pump, please check solvents for requirements, should you need something on the robust side we have a wide variety to suit your needs. 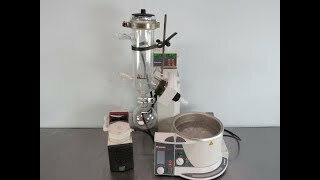 This Heidolph Laborota 4001 Rotavapor has been fully inspected and is performing to expectations, including the pump. All of our lab equipment comes backed with our standard warranty. Should you have any questions, please don't hesitate to contact us.